Richard Yasmine's sustainable table lamps are an environmental "wake-up call"
Richard Yasmine's sustainable table lamps are environmental "wake-up call"
Beirut-based designer Richard Yasmine has created a series of handblown light bulbs that rest on bird's nests, to raise awareness of climate change. Called Wake Up Call, the collection of table lamps aims to challenge people's perceptions towards the environment, especially their relationship to animals and plants. The collection was presented at Milan design week and features three limited edition lamps, with bulbs that resemble bird eggs. 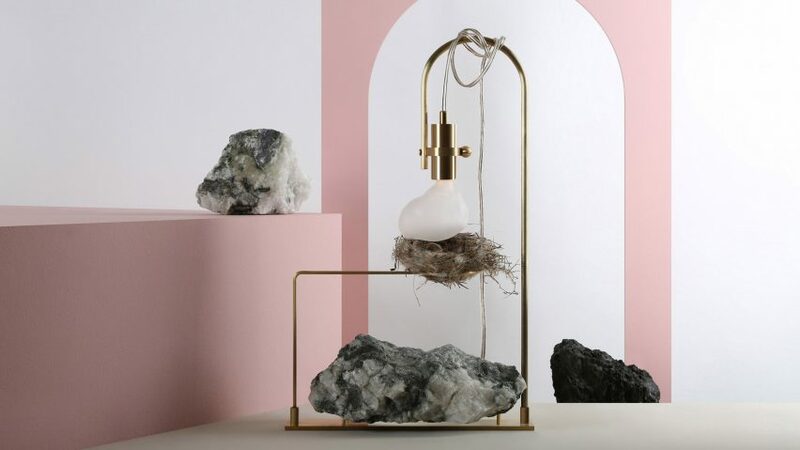 Yasmine styled the lamps with abandoned birds nests and semi-precious rocks, to incorporate objects that had been recycled by nature. "The whole concept reflects the message of recycling and highlights on environmental problems," he told Dezeen. "Even the use of brass and glass, both of them are sustainable materials fully recyclable, both help in saving energy as cullets [the waste glass used in glass-making] melt at a lower temperature than any [other] raw material." "Our natural environment is a priceless part of the universal heritage," he continued. "All animals, forests, plants, minerals and soils have a role to play in our healthy natural atmosphere and all are fundamentally important in every eco-system, therefore it is our responsibility to save it." Each bulb was handblown and sandblasted to form an organic shape, while the stands were given minimalist forms with varying heights. Semi-precious stones were chosen for their resemblance to natural landscapes, and included black tourmaline, emerald beryl and crystal quartz. "I carefully chose shapes that imitates the hills and the valleys to create a graceful musical scene missing nowadays in our cities barely seen far away from our urban life," continued Yasmine. "Not to mention the meaning and the energy transmission of these semiprecious stones," continued the designer, who previously created a series of mirrors with geometric bases. Yasmine often incorporates natural forms in his work. Recent projects include a range of carafes with phallic brass rods and a marble table with phallic brass legs. "I want people and activists to act towards what's happening in our environment and ecosystem," he said. "Being concerned about the environment can feel overwhelming, but there are actions that we should take to help preserve the natural world," he concluded.